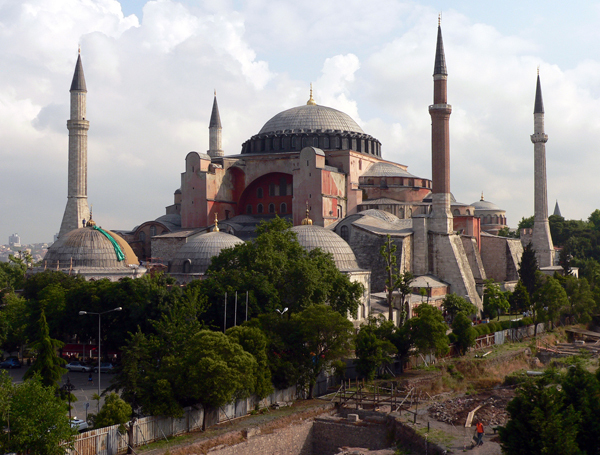 The Sultanahmet Mosque is just down the way from Hagia Sophia. Together they are like bookends to the Hippodrome (Roman entertainment center). 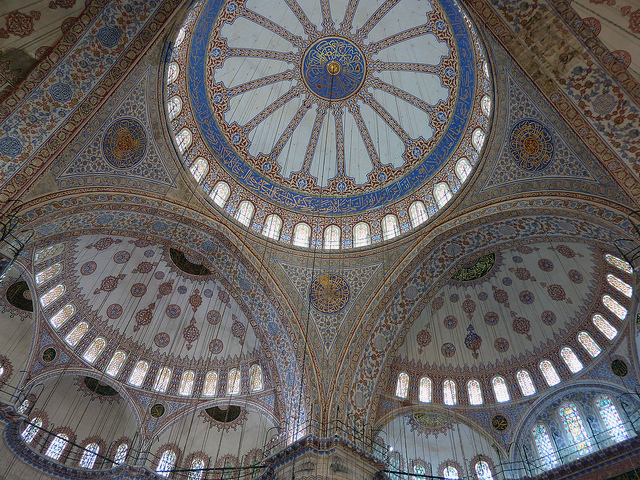 The Sultanahmet Mosque is commonly called the Blue Mosque after the 20,000 hand-painted tiles on the interior walls. 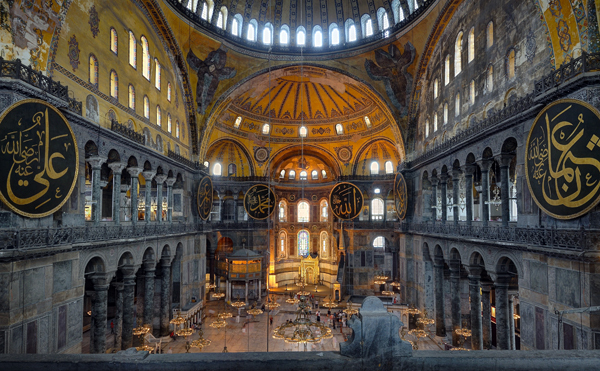 It pairs well with the Hagia Sophia, not only in proximity but also as a complementary experience. While Hagia Sophia draws the attention upward, the Blue Mosque induces inward reflection. Hagia Sophia makes me go Wow! Blue Mosque makes me go ahhh. Inside the Hagia Sophia, I feel small. Inside the Blue Mosque, I feel peace. There’s a lot happening on the walls, with all the painted tiles, but the atmosphere is light and serene. Topkapi Palace is the former residence of Ottoman sultans, where you can shamelessly gawk at the lifestyles of the rich and famous, because it’s history. See the reception rooms, where men reclined on sofas lining the walls. 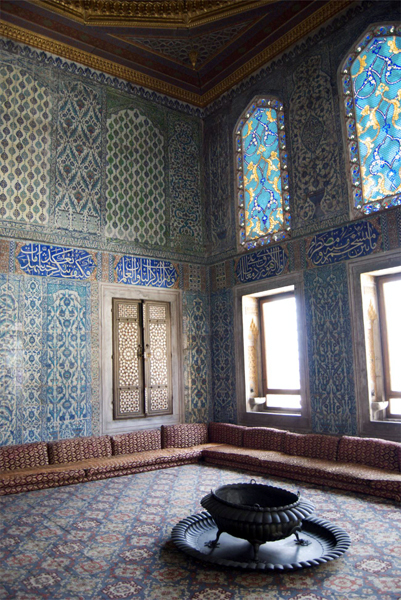 See the harem, where women reclined on sofas lining the walls. See the fabulous jewels. 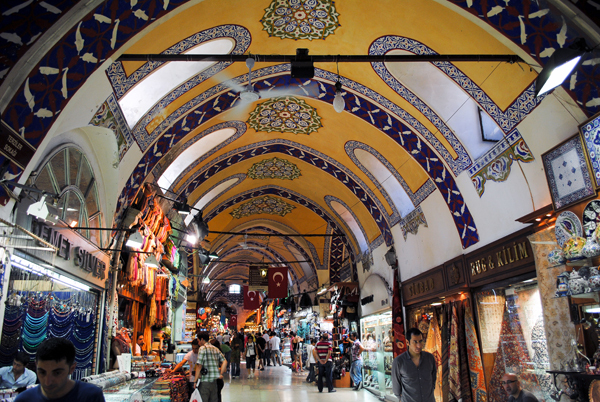 the Grand Bazaar – If you’re a serious shopper, you need a full day or two here and a guide or a map and a compass. For most of us, a few hours is more than enough. One of the oldest and largest traditional covered markets, there are more than 4,000 shops on over 60 streets and they are not laid out on a grid, much. As long as you have an ultimate exit plan and plenty of time, it’s a wondrous place to get lost in. Just about everything you can think of is for sale here, but leather, gold and silver jewelry, ceramics, textiles and carpets are good buys in Turkey. Shops selling similar items are grouped together. Merchants in the Grand Bazaar can be quite aggressive. If you’re shopping for a big-ticket item, you should go in with some knowledge about quality, firm resolve and a sense of humor. the Egyptian Spice Bazaar – This 350-year old market traditionally sold exotic food stuffs – spices, medicinal herbs, incense, oils, but now sells a jumble of products to compete with the Grand Bazaar for the tourist trade. We recommend buying mass-produced souvenirs elsewhere (if you must) and support only the serious, established vendors here. Your guide will help you distinguish which is which. Shops that specialize in nuts, spices or Turkish Delight, for example, and are free of trinkety clutter, tend to have better products. A cruise on the Bosphorus – This is the strait which separates Europe and Asia at Istanbul and connects the Marmara Sea with the Black Sea. (The bodies of water moving in a north-easterly direction are the Mediterranean Sea-the Aegean Sea-the Dardanelles Strait-the Marmara Sea-the Bosphorus Strait-the Black Sea.) This is one of the busiest shipping routes in the world and watching the activity from a café on the shore is a very pleasant way to pass an hour or two. Then take a cruise or a ferry on the water for a front row seat to the centuries of dense shoreline development. It’s thrilling right down on the choppy waterway with all the marine traffic and you move along at the perfect pace to visually absorb the sites – monumental mosques, lavish Ottoman palaces, defensive walls and towers, moldering ancient warehouses, and hundreds of distinctive, mostly 19th-century, waterfront houses of late-Ottoman-era elites. One of my favorite places in Istanbul is the Byzantine Church of the Holy Savior in Chora, also known as the Kariye Camii or the Chora Museum. The surviving structure is mostly from the 11th century, but when the original church was built on this site in the 4th century, it was outside the city walls. Chora means country in ancient Greek. It’s a relatively small church and although pleasant enough, there’s nothing outstanding about the architecture. 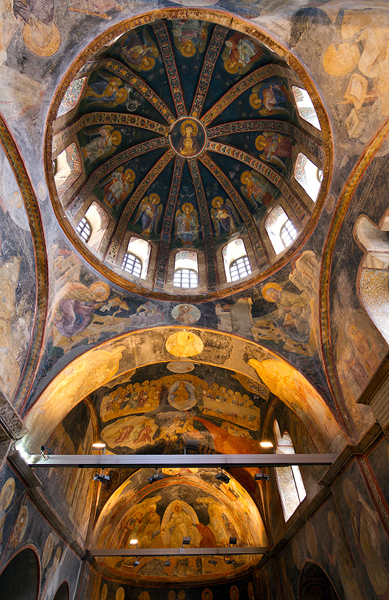 The real reason to visit is to see the 14th-century mosaics and frescos that cover the interior walls. After the Ottoman conquest, the church was converted to a mosque and the figurative art, not allowed in Islam, was covered in plaster. Restoration of the mosaics and frescos began in the 1940s, and today the walls, domes and vaults are wrapped in nearly 50 vivid biblical scenes. It’s wonderful to behold and slightly eerie, the kind of place where you speak in hushed tones, just because. 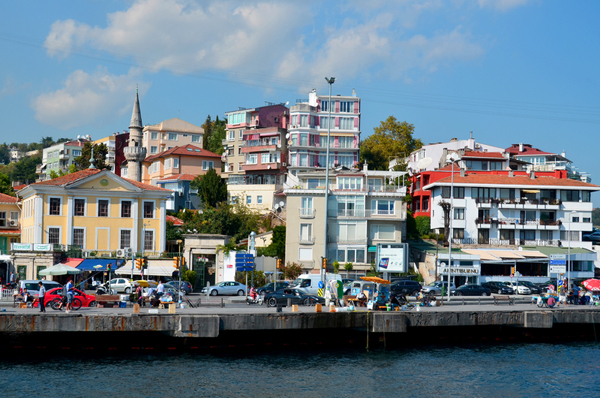 Büyükada Island is the largest of a chain of small islands known as the Princes Islands in the Marmara Sea, about an hour from Istanbul by ferry. 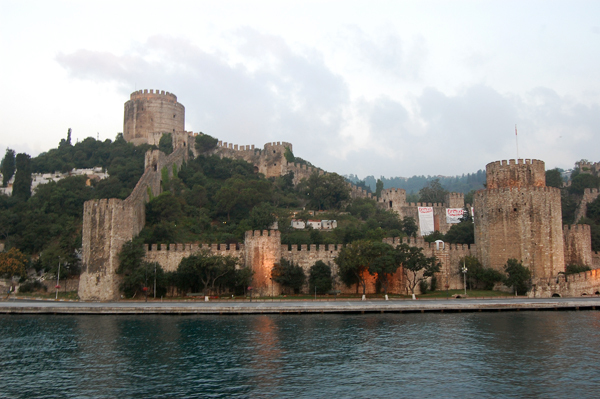 This was a place of exile for ill-favored Byzantine and Ottoman royals but also a place of retreat for wealthy Ottomans. 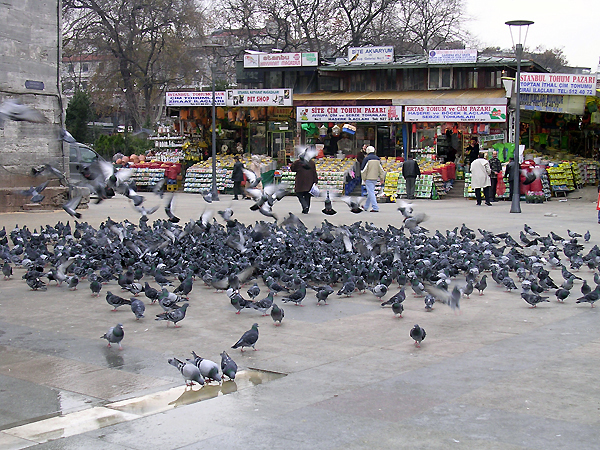 In the 19th century it was a popular playground for Istanbul elites. Today it is an enchanting time capsule, absent motorized vehicles (by decree) and bursting with Victorian villas and mansions, some elegant, some flamboyant, some restored, some in decay, but all interesting. 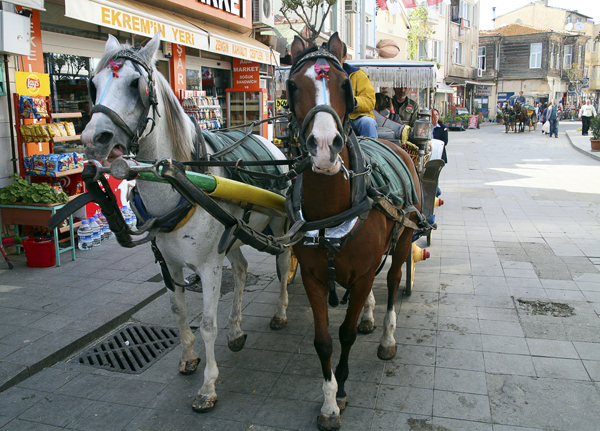 Get around on foot, by bike or by horse-drawn buggy (fayton). Don’t miss the views from the Aya Yorgi Monastery on the summit of the island’s highest hill. Grab a bite in the monastery’s courtyard restaurant and look out across the Marmara Sea to the Bosphorus and Istanbul. This entry was posted in Istanbul, Turkey, Uncategorized and tagged Basilica Cistern, Blue Mosque, Bosphorus, bosphorus cruise, buyukada, chora museum, egyptian spice bazaar, Grand Bazaar, Hagia Sophia, holy savior in chora, Istanbul, princes islands, sultanahmet mosque, Topkapı Palace by yalla2013. Bookmark the permalink.